In 1911, a year after Brooklyn Botanic Garden opened to the public, a showy crabapple (Malus floribunda) was planted on what was then called Rose Family Hill, a grassy slope just west of the lily pools. In the century that followed, the tree’s limbs twisted upward and, even more so, outward. Over the years, it lost some of its biggest branches in storms, or perhaps under the strain of particularly fruitful years. These breaks became hollows that made the tree increasingly susceptible to more branch failures, until in 2015, the tree lost the last of its freestanding branches. Happily, one branch had grown toward the ground and had rested there long enough to take root. 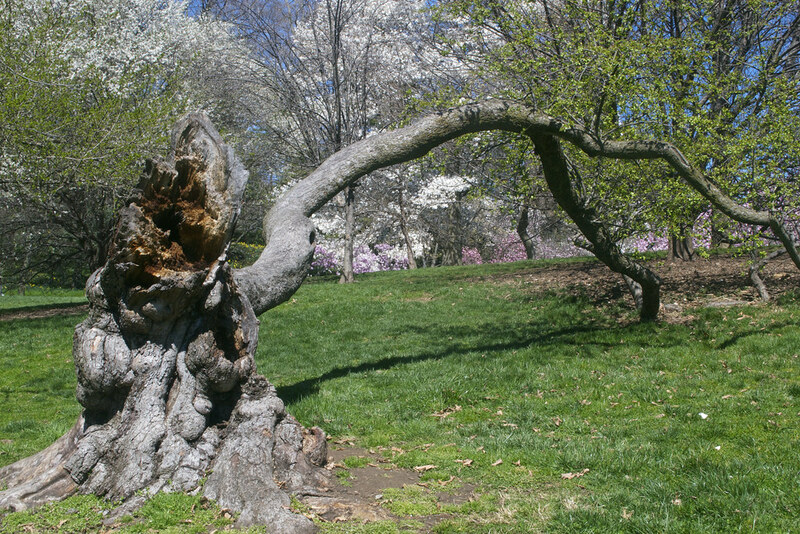 Anchored into the ground, this last branch is safe from breakage for now, but as the original trunk continues to decay, it is inevitable that the connection between the trunk and branch will crumble. If the living branch is sufficiently rooted into the ground by then, it will be able to thrive as a freestanding tree unto itself. There are stories of apple trees “walking” across fields over generations in this way. In its first hundred years, this particular tree has taken a 15-foot step. At the end of its second century, it may be 30 feet from where it started, or maybe back near its original location. Specimens like this gnarly crabapple challenge the way we define an individual plant. When new growth takes off from old rooted branches, has an old tree become young again? Is it the same tree or a different one entirely? It also challenges our notions of what a "good" landscape tree looks like. When choosing plants at the nursery, our tendency is to select for a straight trunk and then remove low limbs over time. This creates an upright tree with a formidable trunk, a classic form. There was a time when this crabapple tree was slated for removal because it didn't match that idealized aesthetic. But here at the Garden, we often see people walk past a towering, classically shaped English oak without taking much notice, and then stop short at this twisted crabapple. They view it from various angles, photograph it, and talk to their companions about it. It occurs to my colleagues and me that if we prune only for classical style or mower clearance, in the next century the Garden will lack specimens with such great character. Not only is this showy crabapple a fascinating tree to observe today, it makes us think about how the practices we employ now shape the Garden of the 22nd century. This Malus floribunda (showy crabapple) specimen has lost most of its branches in its 100-year life, but the last remaining one has managed to take root about 15 feet from its trunk. Photo by Blanca Begert. The rooted branch of Malus floribunda (showy crabapple) in bloom. Photo by Alec Baxt.